What's really cool is that Purex has developed a new and improved way to get the laundry detergent into your washing machine. Purex UltraPacks contain Triple Action liquid detergent into convenient pre-dosed packs which make doing laundry even simpler. Now you can just toss one of these UltraPacks into your washer and get double the cleaning power in each and every drop! No more mess, no more spills...no more heavy jugs! Just toss and go! Try Purex UltraPacks liquid laundry detergent for yourself and see just how quick, easy and convenient laundry can be! 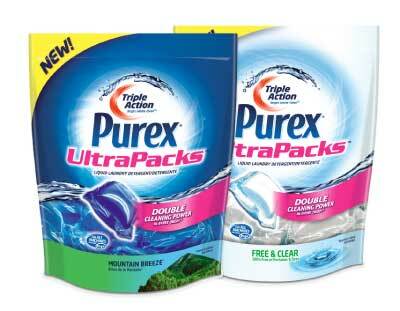 Disclosure: I received the Purex Triple Action UltraPacks from Purex in order to facilitate my review as part of the Purex Insiders Program. No other compensation was received. This product review is based on my own personal experiences with this item and is completely honest and objective.